1:42 PM (Texas time) Well, our girls have survived their first week back in school. Both girls seem to enjoy school a lot and have made new friends, like their teachers, and the lot. 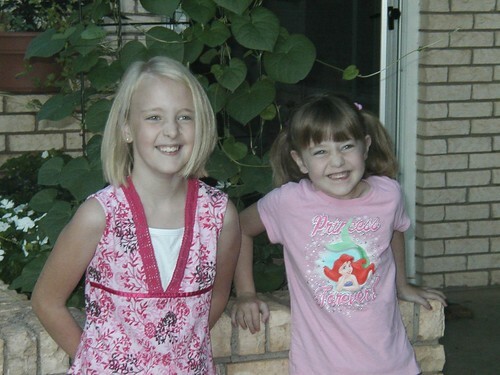 As promised, here are some more pictures of both girls (be sure to notice Elisabeth's haircut and her pierced ears). 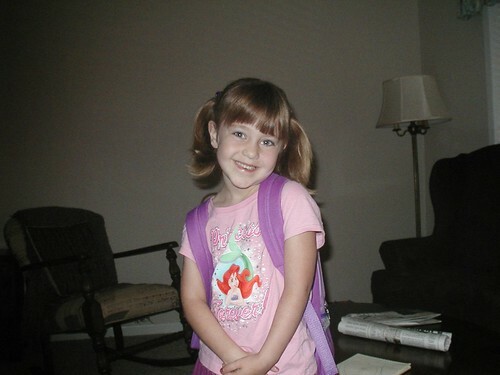 Here's a picture of Sophie showing off her new backpack (and her terrific smile). 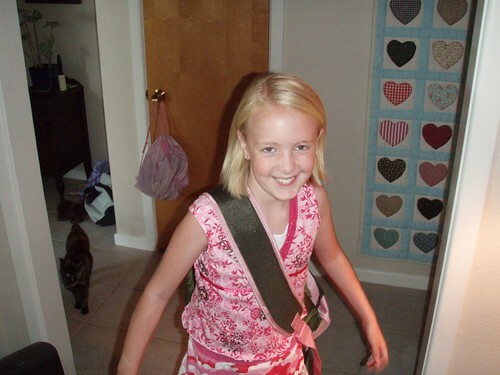 Elisabeth, showing off her stylish pink camo backpack. Both girls, on the front porch, ready to go. 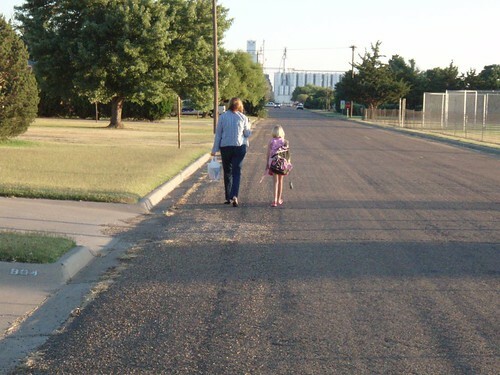 Susan and Elisabeth, walking ahead, on their way to school (you can see one of the huge grain elevators down the road). 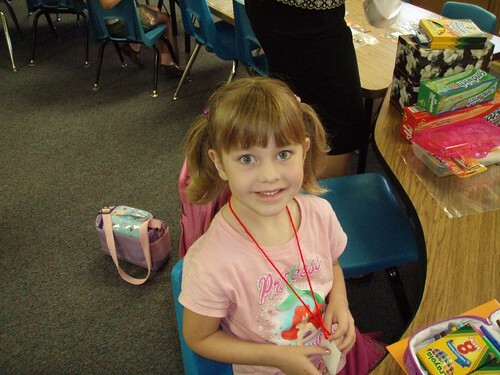 Sophie, getting settled in her new classroom. Everything is going well with all of us. Susan and I are both busy with work. Susan is going to DC this coming week for a spur-of-the-moment work opportunity, so I'll be a single parent for a brief time this week. Good thing the girls and I can get along okay for a couple days at a time (although none of us would consider it an ideal situation). Sophie goes for another check-up this coming Friday. We're anticipating a pretty routine visit, as always. 9:52 (Texas Time) Just a quick post to give everyone an update on Sophie's last visit to the clinic. Things went very well. Sophie only needed to get "poked" once and her counts came back fine. In fact, they are as close to "normal" as they have been since before she got sick more than two and a half years ago. Only one level registered "low" on the report, and I cannot remember which one it was. We're used to seeing a great big "L" next to all of Sophie's counts, so it was surprising to see only one this time. Sophie was not at all excited about getting poked, but she did fine. On another note, we are going to have Sophie tested for the possibility of cognitive delays. We do not suspect anything (far from it), but one possible long-term side effect of chemotherapy is cognitive delays (some research suggests one out of four childhood cancer survivors will experience some cognitive delays). What we're going to do is get a reasonable "baseline" for where Sophie is at, now that treatment is over and she has started at school. This way, we will be able to recognize and identify *if* Sophie is having difficulties in school as a result of treatment. Elisabeth is very excited about her birthday (Friday the 14th). Her party is Saturday in Clovis at RollerWorld. She's looking forward to that. I know it's tough for her to have a birthday so quickly after moving to a new community (we kind of had limited options as far as invitations go), but she's adjusting very well and making friends just fine. As difficult a time as she had with leaving North Carolina, I'm happy to report that she's genuinely happy here in Texas. I'll report more on the party next week! 1:00 PM (Central time): It's been forever since we posted. I guess nothing really exciting has happened, but we've been having a great time. Elisabeth's birthday was great. We opened all the presents we had already received over the course of the day--she was just thrilled with everything. There was a football game (home game) that night, and her birthday was announced over the PA system. She didn't hear it, unfortunately. The announcer is a church member, and when he heard that she missed the announcement, he announced her birthday again this past Friday (it was another home game). She missed it again! He told her at church yesterday that he was going to keep announcing it until she hears it! She was pretty embarrassed about that! She had a birthday party on the 15th at a roller skating rink. Everyone we invited came, which was nice. I think the kids had a great time. I actually put skates on, but the second I got off the carpet and onto the real floor, I realized that perhaps 40-year-olds shouldn't be roller skating. Randall skated and did really well though. I think the most exciting thing that has happened in our household is that we got a new kitten! Well, the human occupants are excited about it, but our existing three cats are less than thrilled. We got the little kitten a few days before Elisabeth's birthday from the Clovis animal shelter. He was 6 weeks old, and he's just adorable and so friendly. He's black and white, and we named him Felix. He loves the girls, and he really wants to play with the other cats. We kept them separate until a few days ago, but now we pretty much let him go wherever he wants to. We still haven't taken a picture of him yet, but when we do, we'll try to remember to post it. 1:40 PM (Central time): We've gotten through almost all of a week, and I am looking forward to the weekend! The weather has turned chilly and there's a real nip in the air. I like that. We have a hectic evening facing us. Elisabeth has dance class at 6:00 in Clovis (20 minutes away), and we have a church meeting at 7:00. It's observation week in dance class, so we really don't want to miss that, so we're all going to have dinner together in Clovis before class, I'll take Elisabeth to class and watch her, and Randall will take Sophie to church (I'll come later and be late). See the kind of boring things you have to read when there's nothing exciting going on?? The meeting at church tonight is a "door-knocking" workshop. Randall learned about it at a seminar he went to a few weeks ago. The pastor who is speaking tonight will talk about how to effectively reach out to neighbors in our community when we want to invite them to a special church event. I think lots of us are not excited about the prospect of going door-to-door, but we sure are curious to hear what he has to say about it. We've all been outside our comfort zones over the last couple of weeks anyhow, since our church is spending a month promoting "Church Outside the Walls"--where we try to do as many activities and meetings off church property, in visible public places, as possible. Yesterday, several of us met in the snack area of a local convenience store/gas station for our prayer group. The old guys who are normally sitting around in there were definitely thrown off by us, but it has given some of us a chance to talk to them about what we're doing and why we're doing it, which was pretty neat. Then we held our choir practice at the nursing home, which was really wonderful. They really enjoyed it, and it made practicing a lot more fun. We're thinking about going over there for practice once a month now. It's great that people in the church are so willing to try these things out!